The “How I Work” series, most noteworthy done by Lifehacker, has been reproduced by multiple authors for good reason: people love to hear from successful and influential people and learn the intricacies of their day-to-day. It can be inspiring and motivating to hear about the best, and oftentimes most simplistic practices. In our “How I Work” interview we refined our questions by adding a few of our own and spiced them up with inspiration from Lifehacker as well as thinkspace mentor Matt Heinz. If you’re interested in checking out our previous “How I Work” interviews they get compiled here. 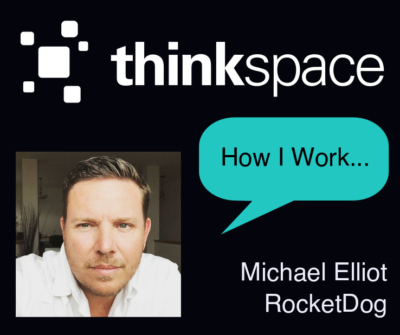 In this edition you’ll be hearing from Michael Elliott from RocketDog. Rocketdog originally launched in 1999 and Michael dove in full time in 2000. Not only is he an active member at thinkspace, he’s also heavily involved in the tech community. This year he was co-lead for Seattle Startup Week and sits on panel discussions often. It’s important for entrepreneurs to make time for themselves and Michael does that by going on hikes with his bulldog Chuck. You can visit Michael, and Chuck sometimes too, in the Seattle office. How do you recharge or take a break from work? Great food and drinks with friends. Sunrise or sunset: Sunrise. It’s such an amazing sense of renewal, though I have to admit I see way more sunsets. Tell us a little about your background and how you got to where you are today. I’m somewhat of an accidental entrepreneur. I enjoy, and sometime dread, controlling my own destiny, but it is the path I have chosen and wouldn’t have it any other way. First thing you do when you come into work? Review my plan/projects for the day, then meditate for 10 minutes. What is your email management strategy? Not as good as I’d like. How do you keep yourself calm and/or focused? Meditation. What’s your perspective or approach to work/life balance? I’ll let you know when I find it. Last thing you do before leaving work? Review my tasks and what I need to finish before end of day. What’s your least favorite thing to do, and how do you deal with it?The hunt. Though I love it, it never ends. What are you currently reading, or what’s something you’d recommend? I’m a big fan of Culture Code, Power of Habit, and The Power of Moments. Who are some mentors or influencers you wish to thank or acknowledge? EO (Entrepreneur’s Organization) has been a fantastic experience over the last decade. It’s like have a built-in brain trust of several hundred of people, that I can reach out to anytime. Is there anything else you’d like to add that might be interesting to readers and fans? I love giving back, and I encourage those around me to find ways to give back in a meaningful way. Interested in becoming a “How I Work” spotlight? Contact Stephanie and she’ll be excited to come chat! The “How I Work” series, most noteworthy done by Lifehacker, has been reproduced by multiple authors for good reason: people love to hear from successful and influential people and learn the intricacies of their day-to-day. It can be inspiring and motivating to hear about the best, and oftentimes most simplistic practices. Bi-monthly, you’ll hear from thinkspace’s Stephanie Slaton, Executive Assistant of thinkspace CEO Peter Chee, as she makes her way around the office getting to know you. In our “How I Work” series, thinkspace will feature members from Redmond and Seattle who are veteran entrepreneurs or startup techies, answering what will become our standard “How I Work” questions. You’ll be able to catch up on previous featured stars here as well. 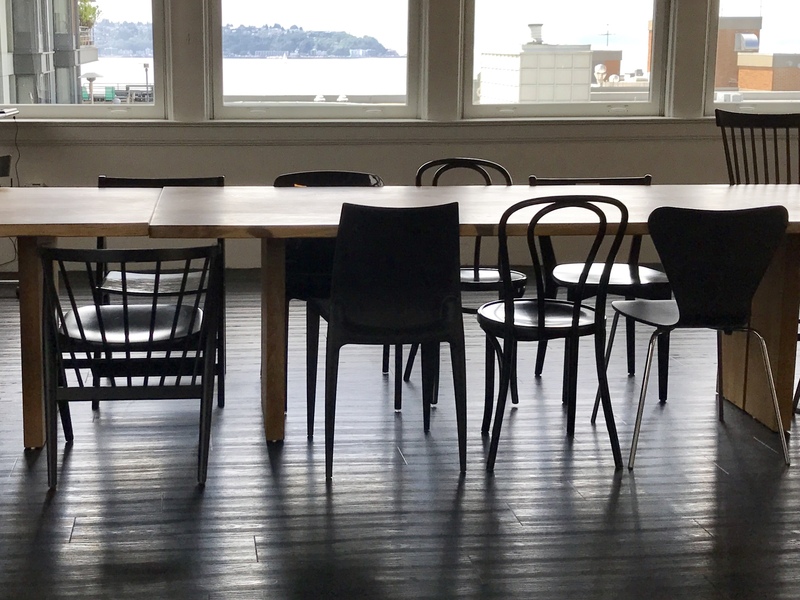 This “How I Work” entry features Tiffany Larson of ZappBug, a thinkspace Seattle member. What was your dream job/passion project as a kid? I was obsessed with animals and wanted to be a Veterinarian. But as I got a little bit older there was a live stream on tv of archaeologists unearthing mummies in Egypt and after that, all I wanted to be was an archaeologist and go to Egypt. Tell us a little about your background and how you got to where you are today. I graduated from college with my degree in Visual Communications and Design. I graduated during the recession and getting a Graphic Design job was nearly impossible. I had an interest in web design and development but my school didn’t offer much at the time, so I taught myself the basics of front-end development. With the help of a little saying “Fake it until you make it,” I was able to get my first web development job for an eCommerce store. I moved on to a social media marketing company and from there to my current role at ZappBug. Number of unread emails right now? Thirteen in my work inbox, 5000+ in my personal. I make sure I check for important emails and I just ignore the others. First thing you do when you come into work? I have to get coffee. What is your email management strategy? I read what is important and then once every couple months I do a mass delete of all the spam and non-important emails . How do you keep yourself calm and/or focused? I make lists for everything. By breaking down larger projects into small tasks it helps me to stay focus and not overwhelmed. I feel a lot more accomplished when I can look at a project and see half the tasks checked off. What’s your perspective or approach to work/life balance? I think it is super important to have a good balance. If you work too hard for too long it can really drain you. I have worked for companies in the past that didn’t believe in the balance and it just burns you out. I am very lucky to currently work for a company that believes strongly in a work/life balance. Are there any work rituals critical to your success? I work in sprints. I spend around two hours at a time getting lost in my work and then I get up and go for a short walk and repeat. What apps/software/tools can’t you live without? PhotoShop, Everything Google (analytics, drive, etc…), and Asana. Last thing you do before leaving work? I double check that I have completed my list for the day and if there is anything left I create a new one for the start of the next day. What’s your least favorite thing to do, and how do you deal with it? I do not enjoy writing, especially large pieces of content which is needed for marketing and websites. Writing is not my strong suit, but obviously most jobs involve a lot of writing. I will usually quickly write something up and have someone copy or edit it, or I will just straight up ask or hire someone else to do it for me. What are you currently reading, or what’s something you’d recommend? “Helter Skelter: The True Story of the Manson Murders.” I have just started it. I am not sure if I would recommend it yet. Who are some mentors or influencers you wish to thank or acknowledge? I have a couple of college professors that really pushed me to do my best, Brian Kamp and Kristine Hwang. Describe your workspace? Organized chaos; my desk is always a little messy. What’s the best advice you’ve ever received? I mentioned earlier, “Fake it until you make it.” We are lucky enough to live in the day of the internet. It is so easy to google anything you don’t know. Interested in becoming a “How I Work” spotlight? 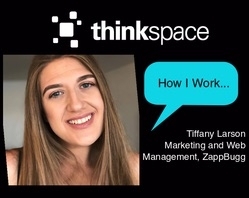 Contact Stephanie at stephanie@thinkspace.com and she’ll be excited to come chat!